The German cruise line TUI Cruises has taken delivery of the Mein Schiff 4 cruise ship from Turku Oy, formerly known as STX Europe. The delivery on May 8th wasn’t just any delivery as it was the first vessel under the new owners of Meyer Werft. Just two days before on May 6th Mein Schiff was delivered, the shipyard in Turku, Finland became fully owned by Meyer Werft which is based in Papenburg, Germany. “Today is a proud day since we have delivered Mein Schiff 4 to TUI Cruises and this beautiful ship is ready to sail. I want to warmly thank the ship builders of Meyer Turku, our subcontractors and the ship owner TUI Cruises for the great cooperation which enabled us together create this sophisticated cruise ship which is comparable to a complex travelling city. Now that Turku yard is 100% family company this makes me even more proud. Our passion for shipbuilding drives us to success with a long-term view. We value our history but we know that we have to constantly reinvent ourselves”, says Jan Meyer, CEO of Meyer Turku Oy. 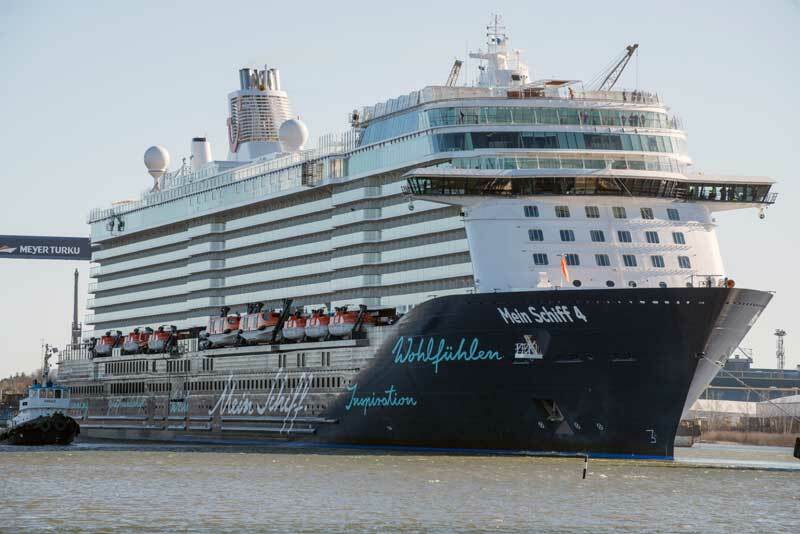 Mein Schiff 4 is the second ship out of 6 new generation vessel for TUI Cruises. the first named mein Schiff 3 was delivered in 2014 and a sister ship was planned to be delivered each year until 2019. With Mein Schiff 4, Meyer Turku has refined its building processes even further. The project entered production two years ago and in February 2014, the keel of the ship was laid in the dry dock, and, in October 2014, the ship got water under her keel for the very first time. “Our expansion is advancing in leaps and bounds thanks to the perfect coordination between the shipyard, our construction team, and all companies involved. We are highly satisfied and delighted at this new addition to our fleet,” says Wybcke Meier, CEO of TUI Cruises. Mein Schiff 5 has already under construction at the shipyard since February 2015 and next month there will be a keel laying ceremony held which is a major construction milestone. mein Schiff 5 will be delivered in the summer of 2016. Following today’s handover, the Mein Schiff 4 will be named in Kiel on June 5, before sailing on her maiden voyage to the Baltic States on June 6, 2015. The new cruise ship is 99,500 gross tons and has a total 1,253 cabins.